During the inter-war period, the World Peace Foundation was the main U.S. distributor of League of Nations materials. 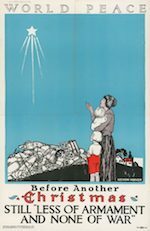 Thus, in our archives and now hanging in our office, is a poster that articulates a never-held, but worthy promise: “Before Another Christmas, Still Less of Armament and None of War.” The bond between armament and war cannot be reduced to the provision the former gives to the latter. More comprehensively, the global arms market produces and extends a way of thinking about—or rather, against—discussion of the common good. The immense profits, secretive deals, and access to public funds incentivize a transactional approach to matters of peace and security. 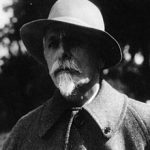 Basil Zaharoff, from the turn of the last century, was a devious dealer who provides us an example. Zaharoff, as WPF’s colleague Andrew Feinstein details in The Shadow World: Inside the Global Arms Trade (2011) , hailed from Greece, but was notable for how he shed his origins. Posing as Prince Gortzacoff, son of a Russian officer, he managed to make himself a fortune through arms deals that regularly supplied multiple sides of conflicts, guided by the profitability of war. While he died on November 27, 1936, the archetype lives on in corrupt arms deals throughout the world. But it is not just the shady, jet-setting individual dealers like Zaharoff, operating on the margins of the law, that are behind the corruption that suffuses the global arms trade, but also the respectable, marquee, multi-billion dollar arms companies, with top stock exchange quotations, boardrooms filled with the great and the good, and close access to governments; and indeed, the activities of these two contrasting faces of the arms business are often closely intertwined and interdependent, as Shadow World makes clear. The World Peace Foundation’s Compendium of Arms Trade Corruption, newly expanded, updated, and improved, details 36 such cases of corruption, large and small, highlighting the different aspects of this corrosive phenomenon. Starting December 1, 2018, the WPF program on Corruption and the Global Arms industry, spearheaded by Sam Perlo-Freeman with Xiaodon Liang, is highlighting one of these corrupt arms deal a day—a militarized and dollarized advent calendar—for the month of December (only a portion of the deals in the Compendium). To keep updated, follow us on Twitter or on our Facebook page.